If you're preparing your Sri Lanka itinerary 2 weeks is a good amount of time to see some highlights but 3 weeks in Sri Lanka will give you a bit more time to soak up the beach scene or do some hiking in the mountains. Here's a roundup of all the best places to visit in Sri Lanka with recommended time in each so you can put together you're own Sri Lanka itinerary as well as our recommendations for the best 2 and 3 week Sri Lanka itinerary. Beautiful little Sri Lanka may be the greenest country I've ever been to. But as well as the rolling hills of tea plantations and jungle this island also has stunning white-sand beaches, ancient temple ruins, gorgeous colonial towns and is affordable and relaxed to travel around. So here's everything you need to know about where to visit in Sri Lanka. Religion: Buddhism is the majority religion in Sri Lanka but there are also large populations of Hindus, Muslims and Christians. Peak travel season in Sri Lanka is between November and March but all year round there is good weather to be found. Between April and November weather on the East coast is better and the hill country may be very wet. Temperatures stay around 30°C the entire year and it is often very humid. Sri Lanka is quite a small country for getting around but there are sometimes long distances to be covered. The train system works well and is very affordable. Tickets for the reserved seats often sell out a few weeks in advance and are only available through travel agencies and increased prices. The unreserved sections are busy but fine for shorter trips. If you want to book train tickets before your trip (including the famous Kandy to Ella train) head to 12Go Asia where you can get reserved tickets at decent prices without having to negotiate the ticket office. Public buses cover most of the south and are regular and affordable. Purchase tickets from the closest bus station or ask your guesthouse to help. Many people hire a driver to get around Sri Lanka and while this is a lot more expensive than public transport it is very convenient especially for a larger group. Expect to pay €60-100 per day or you can arrange transfers separately along the way. Sri Lanka has a huge range of affordable and good quality accommodation. For budget backpackers there are plenty of hostel choices in the main cities and beaches and prices start from around €5 per night. There are large hotels in the cities and a range of apartments and guesthouses on the coast and in the tea area. For an authentic experience you could also look at homestays in Sri Lanka. In the map below blue dots are cities or towns, red are beaches and green are national parks. Most trips to Sri Lanka will start and end in the capital city of Colombo. There's enough here to fill up a day or two of sightseeing if you need to recover from jetlag or have some spare time. But don't go out of your way to spend time here, it's busy, hot and there are far better places to visit in Sri Lanka. Dambulla makes a good base for visiting the sights of the cultural triangle. You can also stay at each place but if you plan to see them all in a short time frame, Dambulla is in a good location to get to each one as a day trip. Anuradhapura - ancient capital with a complex of temples and ruins to visit by tuk-tuk or cycle tour. Sigiriya - Ancient city ruins and rock fortress with stunning views. *Tip* Climbing Pindurangala Rock is cheaper and than Lion’s Rock (fortress) and the views are just as beautiful! Polonnaruwa - Ancient temple ruins. Only recently safe for tourists after the civil war in Sri Lanka this is an off the beaten path option. It's location on the far northern tip of the island mean that few tourists make it there. Plenty of cultural sights, local life and coastal views make Jaffna an interesting addition to your Sri Lanka itinerary. Trincomalee is a port city and home to some beautiful beaches. Like many cities in Sri Lanka the buildings have a colonial influence and there is lots to be seen by simply wandering. The area is also popular for diving and whale watching. Things to see and do: Whale watching, snorkeling, Kanniya Hot Springs, Koneswaram Temple, beaches. Kandy is a bustling little city set among beautiful, green mountains. Most people pass through on their way higher into the mountains or back to Colombo but it's definitely worth stopping for a couple of days to see some of the sights before taking the iconic Kandy to Ella train journey which you can read all about here. Beautiful Ella is the jewel in Sri Lanka's crown and as a result has become very popular with tourists over the last few years. Nestled in the mountains with simple attractions such as waterfalls, hikes and views, Ella is a logical and worthwhile stop on the transition from north to south (or vice versa). Many people also stop off on the way to/from here to in Hatton to climb Adam's Peak. Things to do and see: Little Adam's Peak hike, Ella Rock hike, Ravana Falls, Nine Arches Bridge, visit a tea plantation (we recommend Amba Estate as an ethical choice) For more info about things to do in Ella check out this Ella Guide. Galle Fort is a beautiful little town with lots of gorgeous colonial buildings. Many of them were damaged during the 2004 tsunami but since Galle has been named a UNSECO heritage site there has been funding to restore the buildings to their former glory. Here you'll find lots of little cafes, restaurants and gift shops as you wander the streets. 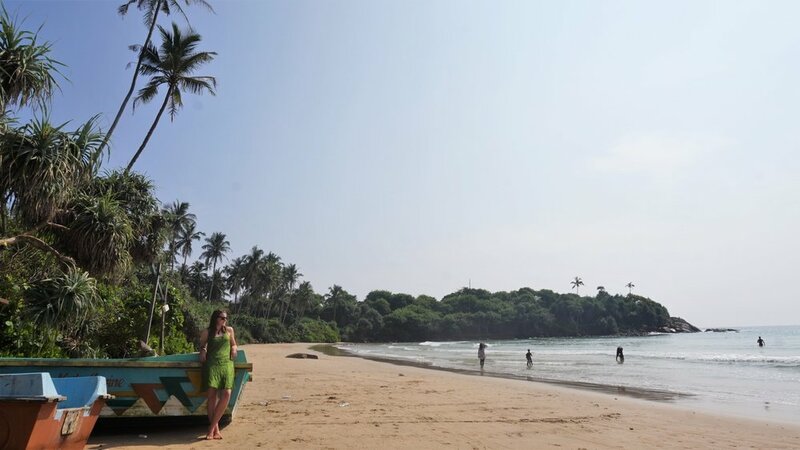 Sri Lanka has so much to see and do and with everything on one compact little island it's very easy to make the most of your two or three weeks in Sri Lanka.